Ayrat and his team were very professional, hardworking and talented. 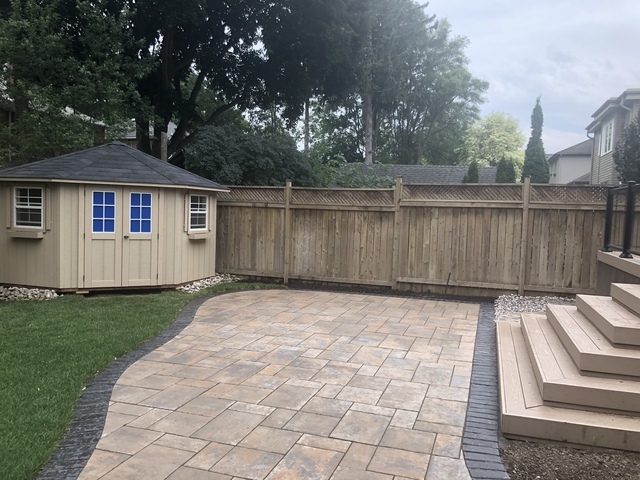 They built a fence around our back yard, installed lighting, made a patio and updated our interlocking around the house and driveway, they also did our porch in natural stone and build two gates on both sides of the house. I would certainly recommend them to anyone. Ayrat is very good at responding to you in a timely manner and offering you good suggestions to help create the look you want. His team started on time and Cleaned up everyday before going home. I can easily say that it was a pleasure to work with them. This is a company that can be trusted to improve the look of your garden and at a reasonable cost. We had a new deck put in a few years ago and found Royal Decks on Homestars. We had a received quotes from a few people but found Miro to be very straightforward, honest (about the pros and cons of different materials), patient, and courteous. Miro was also happy to change the scope (installing glass) after we had originally scoped out the project. I would definitely recommend Miro and Royal Decks. Thank you very much Asif. It pleasure working with you. I am glad you are still enjoying your deck. I really like this company. From the moment we called them, they were very professional and courteous. I had insulation installed throughout the house. Andre was great, got the job done on time. He was very patient with us when the job was being scoped out, answered all of our questions, and got us comfortable with the scope and price. Emil was great as well and even offered a discount on the next job given I was happy with the job and likely to use them again. Importantly, prices are reasonable compared to other options and the variety of things they can do means I am likely to use them again.